Apple and Cheddar Biscuits – Fluffy biscuits filled with bits of apples and cheddar cheese then dipped in butter and rolled in sugar, cinnamon and chopped pecans and baked to perfection. In the United States, the word biscuit usually describes a breakfast bread of some kind. In England, biscuits are what we in America call cookies. No matter where in the world you live, these Apple and Cheddar Biscuits will be called delicious and can be served as breakfast, with afternoon tea or as an accompaniment to your evening meal. 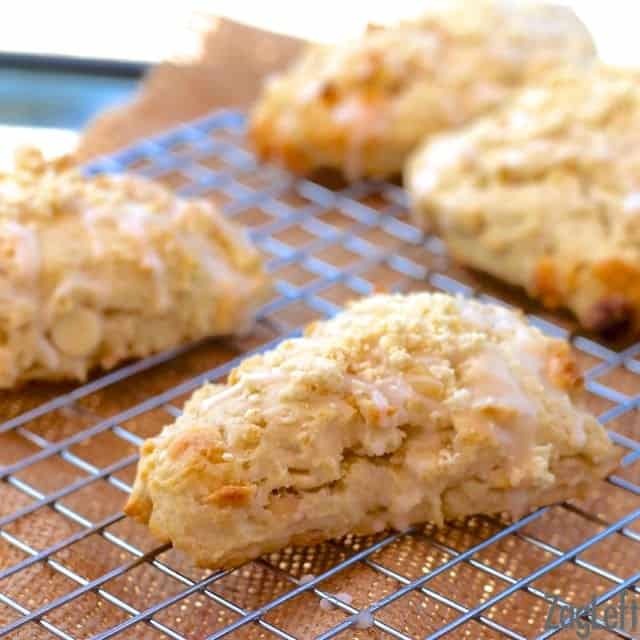 Apples and cheddar cheese are a combination that just seems to go great together and in these biscuits, it’s not exception. These flavorful pillows of dough are moist and fluffy and taste incredible. The combination of apples and cheddar cheese are are a natural flavor pairing and taste so good together. I begin by making a quick biscuit dough using flour, baking soda and salt. Then, I add 3/4 cup of diced apples and 3/4 cup of shredded cheddar cheese. After everything is mixed together, I make a well in the center and pour in milk. I stir the milk into the flour mixture and then I scoop out a hefty spoonful of the dough and roll it in a ball. The amount of dough I scoop is about the size of your average biscuit. I dip it in melted butter then finish by rolling the dough in a mixture of brown sugar, cinnamon, and chopped pecans. Place the biscuits on a baking tray and bake them in the oven for about 20 minutes. These Apple and Cheddar Biscuits are lovely served midday with a cup of tea and are a welcomed surprise when served for breakfast. Most recently, I served these biscuits for dinner alongside a wonderful Roasted Garlic and Brie Soup (recipe coming soon!). Apple and Cheddar Biscuits – Fluffy biscuits filled with bits of apples and cheddar cheese then rolled in butter and brown sugar. In a small bowl, mix together 1/3 cup sugar, the chopped pecans and the cinnamon. Set aside. In a medium bowl, stir the flour, sugar, baking powder and salt until mixed. Cut in the butter using a pastry blender of fork, until mixture looks like wet sand. Add the chopped apples and cheddar cheese to the bowl and mix well. Add the milk all at once. Stir just until mixture forms a ball. Take a large spoonful of the dough and roll it into a ball. Dip the biscuit in the melted butter and roll in the sugar mixture. Love savoury biscuits like these. Definitely a delicious recipe I need to make!